Household water can be divided into three categories: utility grade for lawn and plants, working grade for bathing and laundering, and water for drinking and cooking. Working grade water should be softened so essential household systems last longer and less energy is used when heating water. Drinking water should be filtered using reverse osmosis water systems. Reverse Osmosis is a filtration process used for water. It works by using pressure to force a solution through a membrane, retaining the solute (dissolved solids) on one side and allowing the treated solvent (water) to pass to the other side. It removes many types of large molecules and ions from solutions by applying pressure to the solution when it is on one side of a selective membrane. The membranes used for reverse osmosis water systems have a dense barrier designed to allow only water to pass through while preventing the passage of solutes (such as salt ions). This process requires that a high pressure be exerted on the high concentration side of the membrane. The Hague H3500 RO system is designed for maximum water cleaning efficiency with no operating costs except for periodic replacement of disposable filters. The storage tank stores up to 3.1 gallons of water. The pump is non-electric and fills quickly. The membrane: provides up to 24 gallons of water per day. The H3500 RO system removes chlorine taste and odor, and removes sediment and smaller particles down to one micron in size. The membrane technology consistently reduces up to 99% of total dissolved solids (TDS) and comes with a 25-year limited warranty. Evolve Series Pro and Plus systems represent the highest quality available today in a reverse osmosis drinking water system. These systems boast a 5 stage process that filters ordinary tap water down to the molecular level. The result is healthier, better tasting water for you and your family, all at a fraction of the cost of bottled water. You’ll get the most convenient, highest quality of water right at your tap. The kind of water nature intended us to drink – fresh, clean and clear. 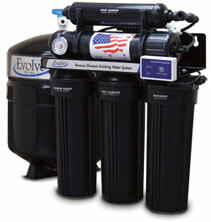 The Evolve Pro RO is rated for 75 gallon per day and will capture large suspended particles (silt, rust and scale) as well as remove unwanted chlorine. The system’s membrane will substantially reduce most contaminants and impurities found in drinking water; flushing those substances down the drain, where they belong. Each system comes with a large capacity holding tank that ensures you will always have plenty of high quality drinking water available at your tap. The Evolve Plus RO has the same performance of the Pro system with a built-in booster pump that eliminates problematic low pressure feed rate problems, thus helping to maintain the system’s maximum production and performance ratings. These made in America, wet-tested systems deliver nothing less than remarkable drinking water. You get the quality of water you and your family deserve for just pennies a day. The Evolve Series EV1 and EV2 water conditioners treat harsh water conditions of all kinds by removing hardness, iron and manganese in just a single pass. The same unit also adjusts low pH levels and produces a small amount of chlorine to sanitize the media bed when the system regenerates. Both the EV1 and EV2 utilize irregularly-shaped Crystal-Right medias to provide superior ion exchange and a better bed for filtering. Because they are impervious to chlorine, they can withstand the free chlorine needed to kill iron and sulfur bacteria. This is the bacteria that can produce foul smells and tastes, and discolors household fixtures. Both the EV1 and EV2 remove hardness, iron, and manganese. The EV1 raises low pH. Evolve Series EVBF backwashing filters are custom-configured to address the specific water treatment issues such as neutralizing acid, chlorine, iron and turbidity or muddy water. These units do not require filter changes which reduces service costs. Hague’s WaterMax generates clean, soft water quickly with little regenerant and it uses very little water in the process. Regenerant is a chemical compound such as sodium chloride brine or potassium chloride used for ion exchange. The Hague WaterMax has two compartments. Compartment 1 is a sediment filter designed to extend the life of the resin bed. Because of the design of compartment 1 there is never a need for replacement filters or maintenance. Compartment 2 has a fine mesh resin which treats hard water. The resin is vacuum packed, allowing it to filter sediment to 20 microns, smaller than the human eye can see. Ion exchange water softeners eliminate scaling on pipes and fixtures, while reducing the need for soap and detergent use up to 70%. Ion exchange water softeners remove hard minerals, use small amounts of salt, regenerate on demand, and are very reliable. The WaterMax has a Hydro-Slide Piston Teflon for years of trouble-free operation. It has been tested for over 100,000 cycles with no detectable wear. The valve piston uses magnetic technology, with no solenoids or switches to wear out. Cleaner and brighter laundry—uses less laundry detergent which reduces expenses. Clothing lints less in the dryer which keeps clothes in good quality condition. Eliminates scaling on pipes and water appliances, such as water heaters. Soft water allows you to save up to 75% on soap products simply by allowing soap to do its job. Prevents white spots that typically form on dishes from hard water. Can provide safe, clean filtered drinking water to your kitchen sink and ice maker, saving expenses on bottled water. Gone are the hard water deposits that damage hair and the soap curd that blocks skin pores. Also with clean, soft water, your fixtures will sparkle and shine. Cleaner bathrooms take less time to clean—with soft water, you eliminate the need to scrub soap scum. Think of all the things you would rather do than clean up hard water problems! Gone are the objectionable taste and odors that may invade everyday tap water. Enjoy the great natural taste of water. You’ll find food and beverages taste better and look better. Save on plumbing maintenance and hot water energy. Hard water is hard on your plumbing and the damage that results costs you money. Hard water also builds up a layer of scale in your water heater. Did you know that as little as 1/8″ of scale could increase your water heating costs 30%?